Treatment of the abdomen and pelvis during menstruation. Deep X Ray therapy or other ionizing radiations (in the last 6 months) in the region to be treated. Patients who are unable to comprehend the therapist’s instructions or who are unable to cooperate. Instruction for Use Please consult the Instructions for Use for more information on indications and contra-indications and for warnings and recommendations. These indications and contra-indications originated from the Curapuls 670 Instruction for Use 1670750-42. Pulsed ShortWave Therapy is a form of high-frequency electrotherapy using oscillations with a frequency of 27.12 x 106 Hz. This corresponds to a wavelength of 11.06 metres in a vacuum. Waves with a length of between 10 and 100 meters are now referred to as 'short waves'. The more traditional name of 'ultra-short waves' is, in fact, incorrect. The most appropriate term for the waves used in this type of therapy would be '11 -meter waves'. The frequency of the oscillations has been established by international agreement (first reached at Atlantic City in 1947) in order to prevent interference with other forms of RF transmission. From the research of the physicist and chemist Faraday (1791 - 1867) and the physicist Maxwell (1831 - 1879) it is known that an electrical field gives rise to a magnetic field and that, conversely, a magnetic field will create an electrical field. Maxwell also suspected that electromagnetic energy can pro¬pagate in space in the form of electromagnetic waves. Later, in 1878, the existence of these electromagnetic waves was demonstrated by the physicist Hertz (1857 - 1894), who also investigated their properties. PSWT employs the same operating frequency as traditional SWD ie. 27.12MHz. The output from the machine is pulsed such that the ‘on’ time is considerably shorter than the ‘off’ time, thus the mean power delivered to the patient is relatively low even though the peak power (i.e. during the on pulses) can be quite high (typically around 150 – 200 Watts peak power with modern machines, though some still go up to 1000W). The control offered by the machine will enable the user to vary (a) the mean power delivered to the patient and (b) the pulsing parameters governing the mode of delivery of the energy. It would seem from current research that the mean power is probably the most important parameter. It is believed that the response of biological systems to electromagnetic energy could be the result of either thermal or ‘athermal’ effects. The heat developing in the tissues after 20 minutes of application of SWT was found to peak at 15 minutes, after which it levelled off for 5 minutes and then started to decline slowly at a rate of around 1 per 5 minutes (Draper et al 1999, Valtonen et al 1973). Therapeutically, a temperature increase of more than 1°C is useful for mild inflammation and an increase between 2 and 3°C is helpful in reducing pain and muscle spasm, whereas an increase of 3–4°C is necessary to cause changes in tissue extensibility (Lehmann 1990, Prentice & Draper 2001). The demonstrated changes in cell behaviour were found to be reversible immediately on termination of application if the increase in temperature was less than 1°C (Michaelson & Elson 1996, Tenforde 1996). The clinical effects of PSWT are primarily related to the inflammatory and repair phases in muscuoskeletal / soft tissues. The effects list is remarkably similar to that of ultrasound and laser therapy – which is not surprising given their probable common mode of action. The key difference in their clinical use relates to WHERE the energy is absorbed rather than the effects achieved. “There is growing evidence to suggest that over the past two decades, the use of PSWD may have surpassed CSWD as the delivery mode of choice. A possible explanation for this shift may be that the application of PSWD, associated with less stray radiation, is safer for the operator (Tzima et al., 1994). Guo et al. (2011) report on Pulsed RadioFrequent Energy which is exactly what PSWT is. “PRFE is an effective, easy-to-administer treatment modality used in the adjunctive care of patients in numerous clinical areas. It has been used in soft tissue as a palliative treatment for pain and edema (both postoperative and non-postoperative), and as an adjunctive wound healing therapeutic. When used as directed, adverse side effects are rare. 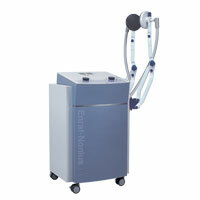 The treatment is non invasive, and can be applied locally to the target tissue. In efficacy studies related to postoperative and non postoperative pain and edema, PRFE treatment has been reported to not only relieve pain and edema, but to facilitate faster recovery time and to reduce length of hospital stay, a notable benefit in an era of ever-increasing health care costs. Its effectiveness at promoting the healing of difficult-to-heal wounds, such as diabetic and chronic wounds, makes it an important adjunctive wound healing treatment option, particularly for wounds non responsive to standard of care treatment. With the number of patients presenting with diabetes on the rise, as well as a growing geriatric population, this is particularly noteworthy. 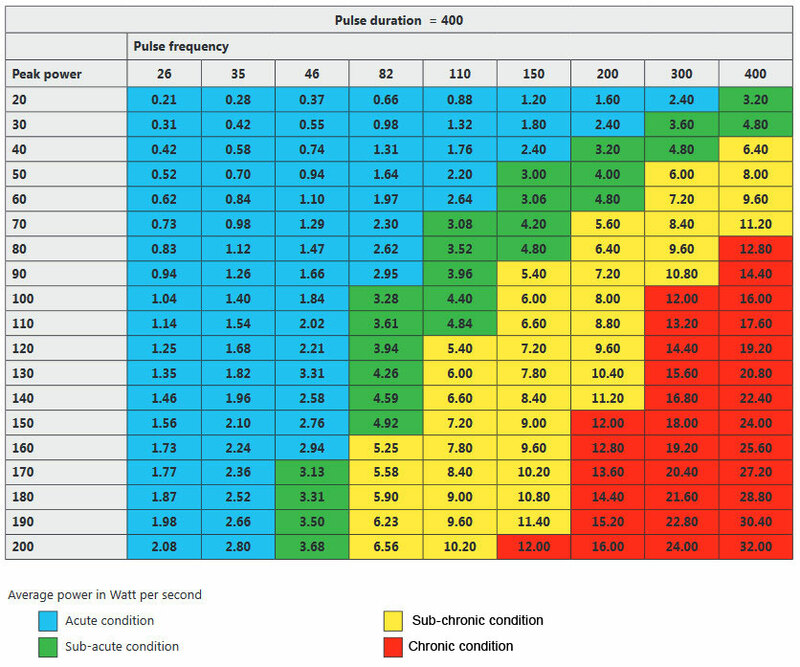 In the Curapuls 670 this relationship between Peak Power, Pulse Frequency, Pulse duration and the effective Average Power is pre-defined and related tot the chronicity of the indication. This can range from acute (a-thermal) to chronic with a thermal component. This corresponds with the average power of the device. Curapuls 670 will automatically enter the correct values for parameters such as pulse duration, pulse frequency and peak power for you. 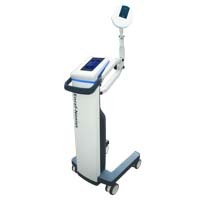 With its low-power settings , this device is exceptionally well suited to the (non-thermal) treatment of acute conditions. Recent large-scale research has shown that this method is particularly well suited to the relief of post-operative pain and the promotion of post-operative wound healing. However, the device can also be used to achieve thermal effects, as well. Even these higher levels of power can be safely administered, and they are very effective in the relief of pain caused by chronic conditions such as osteoarthritis. Please go to www.electrotherapy.org for more information. Draper, D. O., K. Knight, T. Fujiwara, and J. C. Castel. “Temperature Change in Human Muscle during and after Pulsed Short-Wave Diathermy.” The Journal of Orthopaedic and Sports Physical Therapy 29, no. 1 (January 1999): 13-18; discussion 19-22. https://doi.org/10.2519/jospt.1999.29.1.13. Kumaran, Binoy, and Tim Watson. “Radiofrequency-Based Treatment in Therapy-Related Clinical Practice – a Narrative Review. Part I: Acute Conditions.” Physical Therapy Reviews 20, no. 4 (August 2015): 241–54. doi:10.1179/1743288X15Y.0000000016. Kumaran, Binoy, and Tim Watson. “Radiofrequency-Based Treatment in Therapy-Related Clinical Practice – a Narrative Review. Part II: Chronic Conditions.” Physical Therapy Reviews 20, no. 5–6 (November 2, 2015): 325–43. Laufer, Y., and G. Dar. “Effectiveness of Thermal and Athermal Short-Wave Diathermy for the Management of Knee Osteoarthritis: A Systematic Review and Meta-Analysis.” Osteoarthritis and cartilage / OARS, Osteoarthritis Research Society 20, no. 9 (September 2012): 957–66. doi:10.1016/j.joca.2012.05.005. Michaelson, S.M. and Elson, E.C. (1996) Modulated fields and “window” effects, in Polk, C. and Postow, E., (eds. ), Biological effects of electromagnetic fields. Boca Raton, FL, CRC Press.